Howdy y'all! 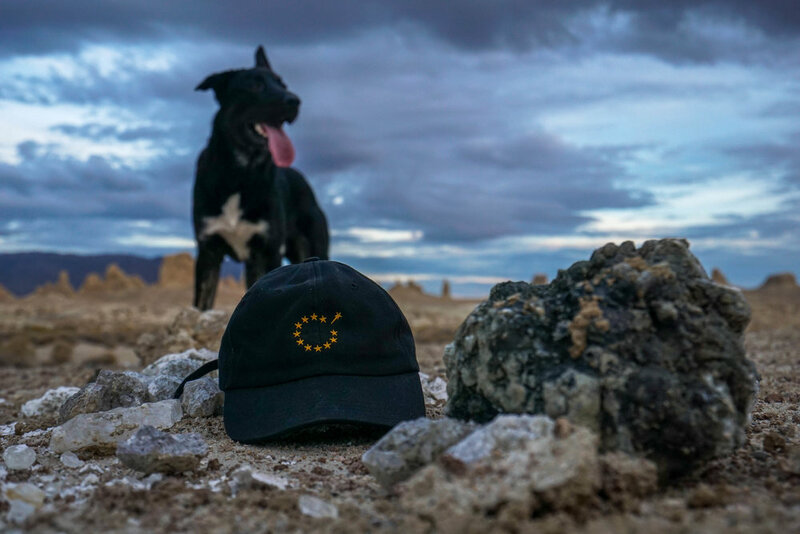 A day after Halloween, the Cosmonaut crew takes a pit-stop en route to the Trona Pinnacles, a spire filled desert amphitheatre that is truly straight outta this world. Alas we reach our destination. A place so otherworldly scenes from Planet of the Apes were filmed here. 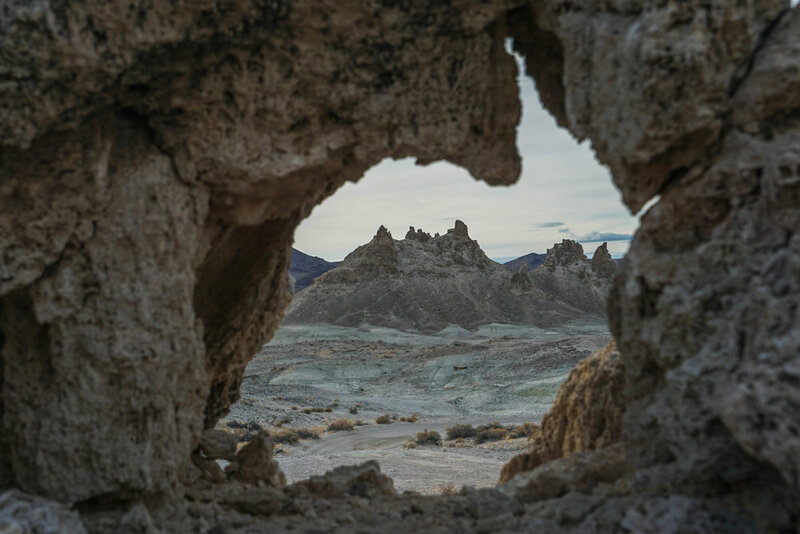 The pinnacles formed under an ancient sea that evaporated & eventually revealed their funky appearance. While trying to set up a hammock one our comrades took a nasty spill atop the rocky formations. Wouldn't be a misadventure if something didn't go as planned. With camp set up, we begin the customary exploration of our stomping grounds for the weekend. And of course that means a climb is in order! Atop we get a full glimpse at the wildness of this lunar landscape. Its places like this that reveal how alien Earth truly is. Back on level ground the crew enjoys some rest & relaxation in anticipation of our sunset hike. The previous night's rainstorm left behind magnificent clouds which cast an amazing light show as they glided past the sun. Tempted by this very show, we set off to explore further out from camp. The rain even left behind some water for ole' Zero. Pools like this don't last long in the desert; its presence was a sweet reminder of the rare conditions we were witnessing. All smiles, stuntin' in some Cosmonaut duds. The original Cosmonaut's had Laika the Space Dog, we have Zero. Eager to gain another view from above we begin ascending the pinnacles. 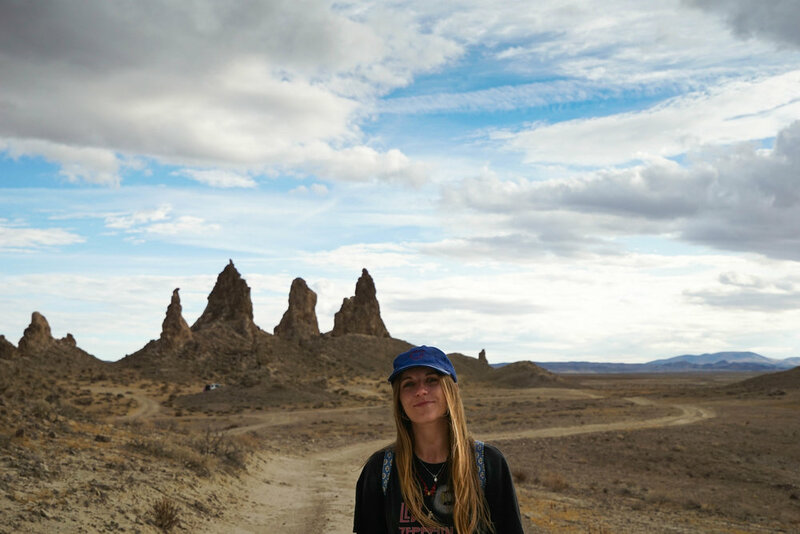 Some of the pinnacles rise up 140 feet. Amazing to think they grew to this size from pebble upon pebble stacking beneath an ancient sea. All the way up to where the crows fly. The spires create the perfect spacey scene for a Cosmonaut. 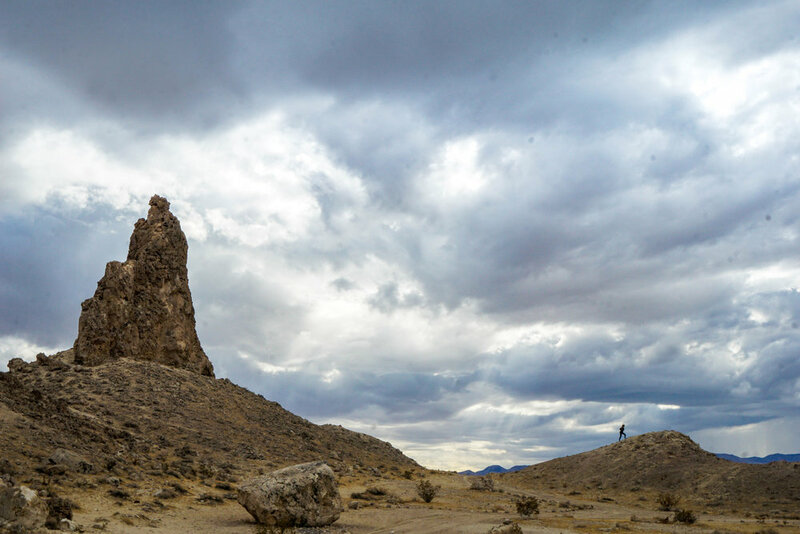 Over 500 pinnacles are scattered throughout this landscape. Seriously, are we on the Moon? 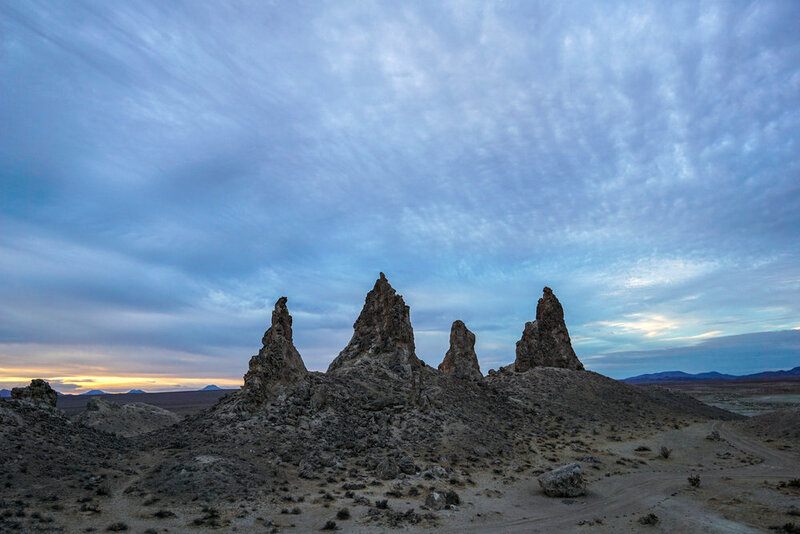 The pinnacles stand like grand monuments guarding over this alien desert. 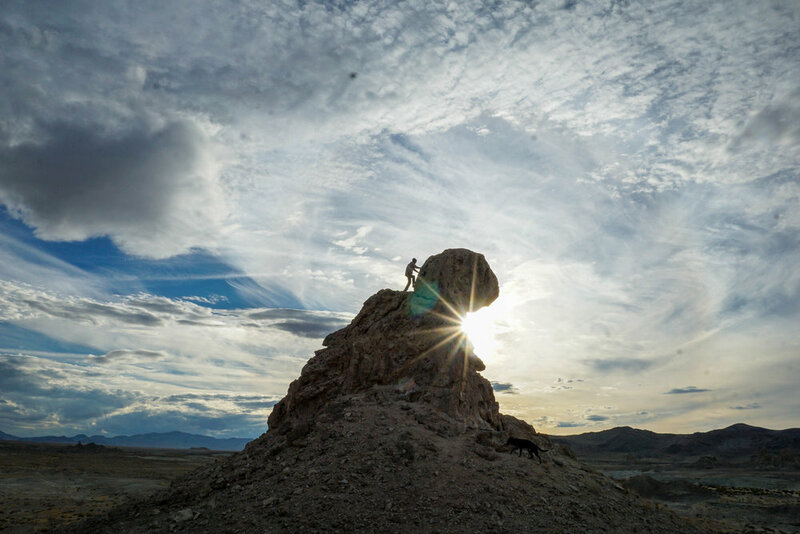 The light games continue & we decide its time to search for another set of pinnacles before the sun sets. After all, there's over 500 of them to choose from. But not before one quick side climb. The moon rock like appearance has inspired numerous space movies & shows. Over 30 film projects per year take place here. Aside from Planet of the Apes, Startrek V (1989), Lost in Space (1965) and a music video by Rihanna (2016) were even filmed here. 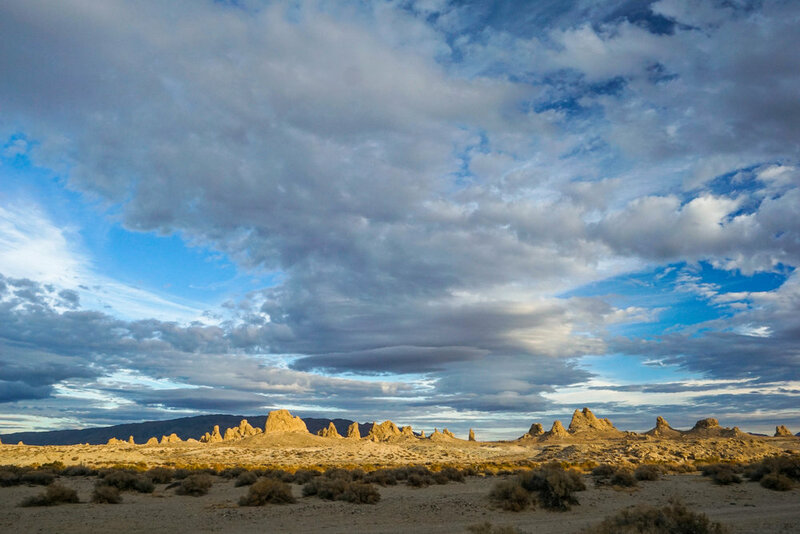 Among the pinnacles all earthly problems disappear with the setting sun & for a moment all that matters are the sights before our eyes. 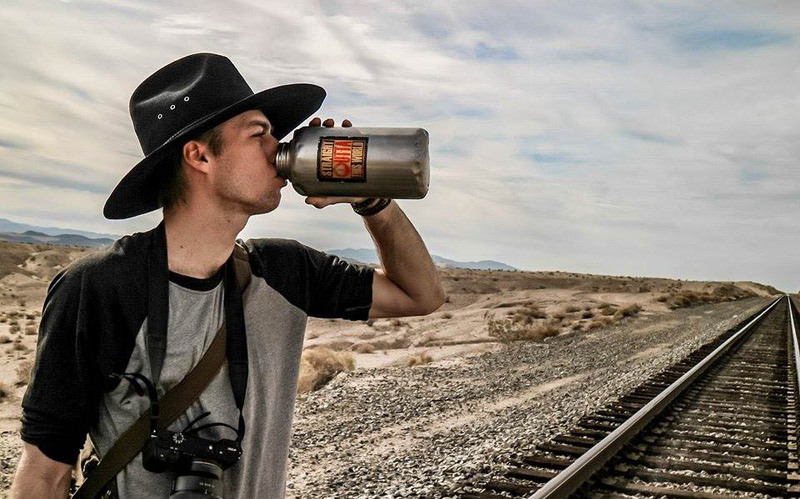 Life is about stealing as many of those moments as possible & a roadtrip is only one way to capture 'em. Create art, read a book, research history, investigate your ancestry: find your misadventure. In an effort to reach camp before last light, we scurry off back. At the bottom we find some rad moonstones to serve as the perfect foreground for a shot of our "Rogue Star" 90's fit cap. During our walk back we realize we forgot to bring our tent; the puddles served as a tense reminder that rain was forecasted for the night. The best part about rain clouds though? Sunsets! Earth just keeps looking more & more spaced out. What a myriad of color! With the color fading, the ominous possibility of rain becomes more obvious. Once the stars come out, the spaced out nature of these spires becomes all the more apparent. 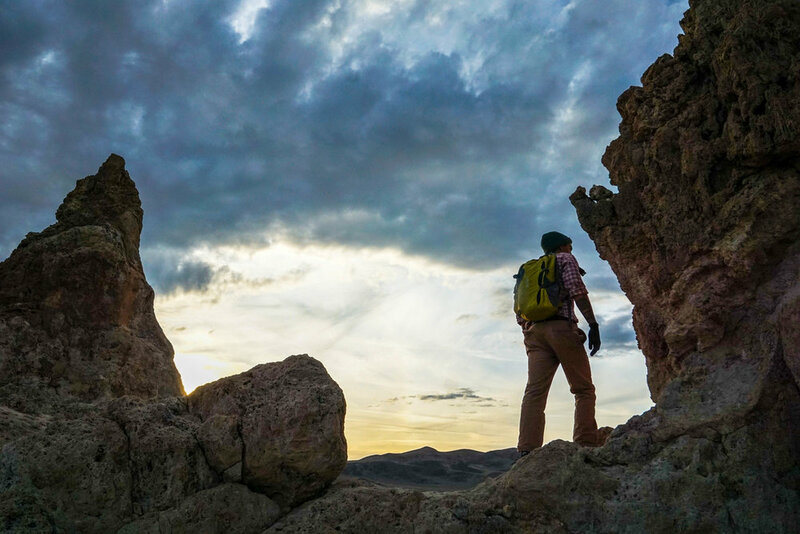 The golden glow of the clouds above the pinnacles transported us to a foreign world. Planet Namek? Half expecting to see Dende or Piccolo flying across the skies. After hours of storytelling & stargazing we call it a night. With no tent we were hit by a short burst of rain without cover. Mornin'! Sights like this are precisely why sunrise is a Cosmonaut favorite. There's something mesmerizing about first light. The sun's warming kiss reappears after a night of cold, and in our case, a splash of rain. Considering we had to sleep outside since we forgot our tent, we were lucky for only a short rain. And none of our sleeping gear got uncomfortably wet. These magnificent pinnacles vary in age from 10,000 to 100,000 years according to current measurements. They were not formed all at once. It is said they were created during 3 separate ice ages. 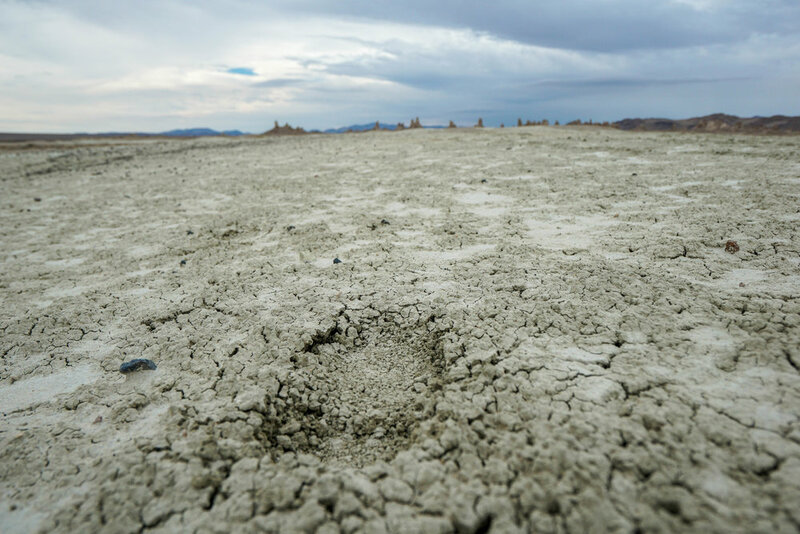 Bubbling fissures beneath the ancient sea that once spanned all the way from Death Valley to Mono Lake released calcium carbonate & formed the spires. 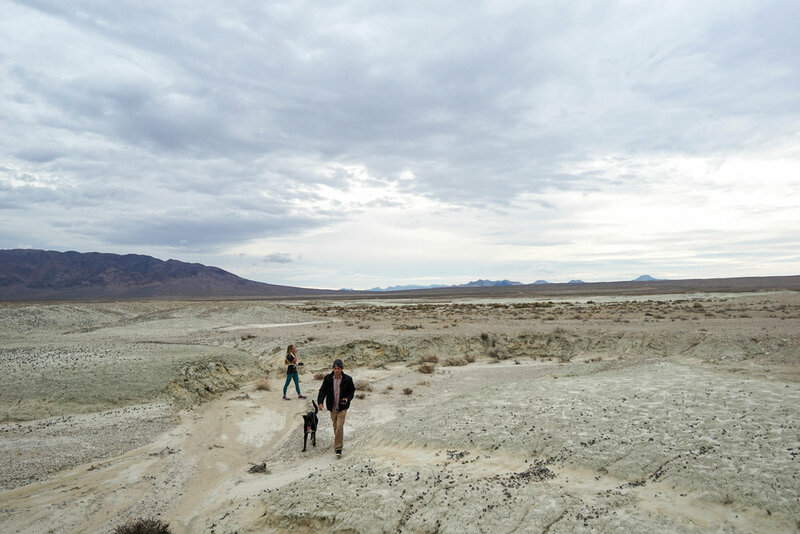 After some morning yoga & a quick breakfast we head to an expansive dry lake bed we spotted in the distance. Flash floods create ribbons from the run-off through the salt flats. It only averages 3 inches of rain annually here, but the rocky ground is unable to soak up much water at once. 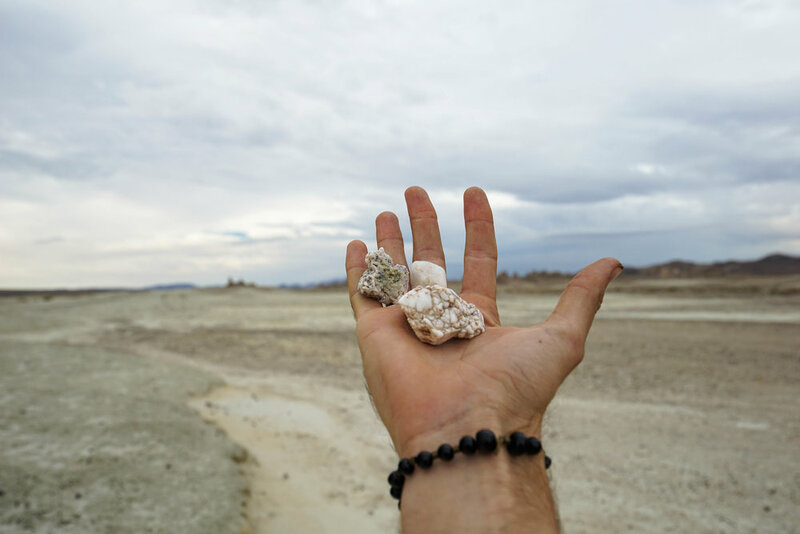 This dry lake bed is rich in minerals including Borax, Pink Halite, Hanksite & Trona. The most well known borax company got its name from the 20-mule teams hauling minerals to the San Pedro Harbor. Once a year in October, the neighboring town of just 1,800 people hosts the Gem-O-Rama, where geology buffs & explorers alike test their luck in the gem-rich briny waters. Even found some treasure of our own. One small step for...., well you know the rest. Some believers in the moon landing conspiracy theorize this was the location NASA faked the whole thing. Gotta admit: if someone was going to fake a moon landing, this would be the place to do it. Zero lookin' like a Chupacabra on the prowl while playing some moon rock fetch. Its his favorite game & he's not shy of showing it. The freedom of a misadventure engulfs all tension or worry, & most of the time a smile is glued to our face. Humans, dogs & Cosmonauts alike! Time to hit the ole' dusty trail back on home. Until next time comrades!